Greetings from Winnebago, the residence of five sisters who are actively engaged in mission work in the parish, St. Augustine school, and the larger community of the Omaha and Winnebago Reservations. At Macy, after a lengthy search for pinpointing the most urgent needs, a thrift shop is being developed. It operates out of Our Lady of Fatima church, using a purchased trailer that was placed next to the church for storage, etc. A group of volunteers from Duchesne Academy as well as local help from Susi French and her children showed enthusiasm and perseverance in helping the sisters and mission staff to get ready and run the opening event of that venture with a successful variety sale, especially of winter clothing. We are so glad that Sr. Hilda, the “brain” and driving force behind so many of our involvements has been restored to health and is among us again. She brought together a FOCUS (Fellowship of Catholic University Students) group of 13 missionaries from as far away as Texas, Oklahoma, California, Chicago, Wisconsin, Colorado and Omaha. The week began with them conducting a retreat for our Confirmation class on Sunday, March 16, followed by a parish volunteer appreciation dinner the next day. Many people from all our four parishes came and were pleased to be appreciated. Three days of parish mission followed. We also had opportunities to share our congregation and personal stories with these zealous missionaries. During the day they also did service projects, working with the sisters and engaged with our school children. 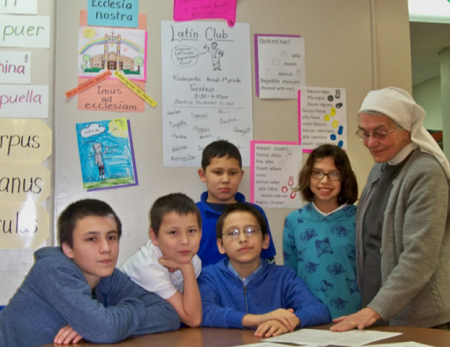 On another level, a Latin Club open to all K-8 student at St. Augustine School began to develop slowly. At first, no time could be found, but then the administration agreed to let Sr. Frances have half an hour every Tuesday after school. Participation fluctuated from a high of 14 down to a handful of regular attendants in second semester because of other simultaneous after-school offerings like swimming, walking wellness, basketball, track…. Some parents see to it that their children attend faithfully, thereby hoping to start valuable foundation for their future success because the principles of English grammar and over half of all our vocabulary are derived from Latin. Many technical terms, esp. in science, medicine, law and engineering come from a Latin base. And: Latin is the official language of the Catholic Church. Also, Latin is an excellent preparation for the study of many modern languages. Thanks are owed to Mr. Patrick Greyhair, a Winnebago elder, who was the driving force behind this adventure.